« Summer Drinks: How to Make the Best Lemonade and Peach Iced Tea Ever! Let me tell you a story: Once upon a time, I was a 5 year old flower girl in a wedding. White dress, adorable, the whole nine yards. Well adorable until I, the 5 year old flower girl, got rip-roaring drunk. No, this is not a tale of bad parenting, but a cautionary tale. You see, at the wedding they served a cocktail, and in those cocktails were maraschino cherries. You know, the bright red ones. Anyway, since maraschino cherries are somewhat gross to the adult palate, apparently, lots of the adults left them in their empty glasses. 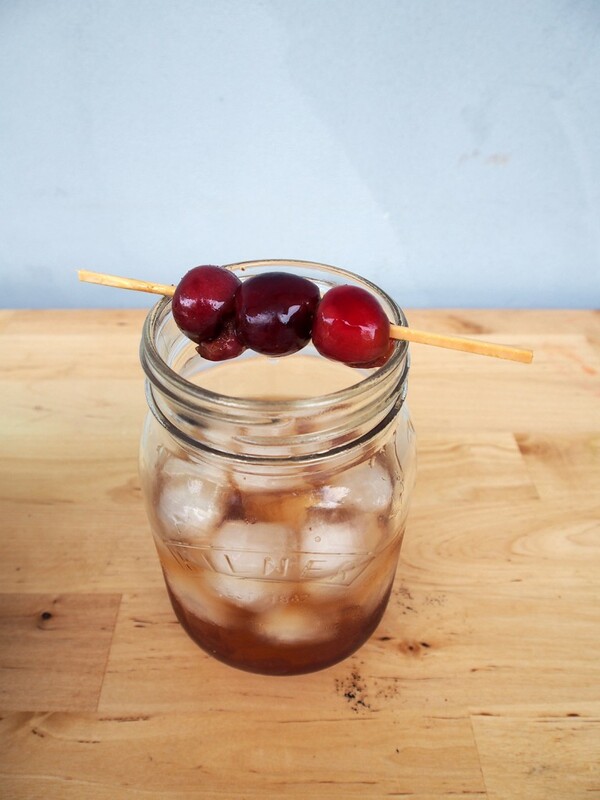 And since as a 5 year old child nothing tasted better than super-sweet candied cherries, I went from table to table, plucking the booze soaked cherries from the empty cocktails and eating them. A few dozen boozy cherries later, and I was tanked. My parents were somewhat embarrassed and my pristine white dress was stained red from cherry juice. Cut to 25 year later. I STILL love boozy cherries, but I’ve learned to enjoy them more responsibly. Of course, at this point, in the age of craft cocktails, I’m not satisfied with the almost-glowing red canned maraschino cherries of my ill-spent youth. Instead, I generally make my own homemade cocktail cherries. These awesomely flavorful brandied cherries are perfect in a cocktail, incredible on ice cream, and delicious on their own. We’ve also mixed them in to sangria, syrup and all – SO good. 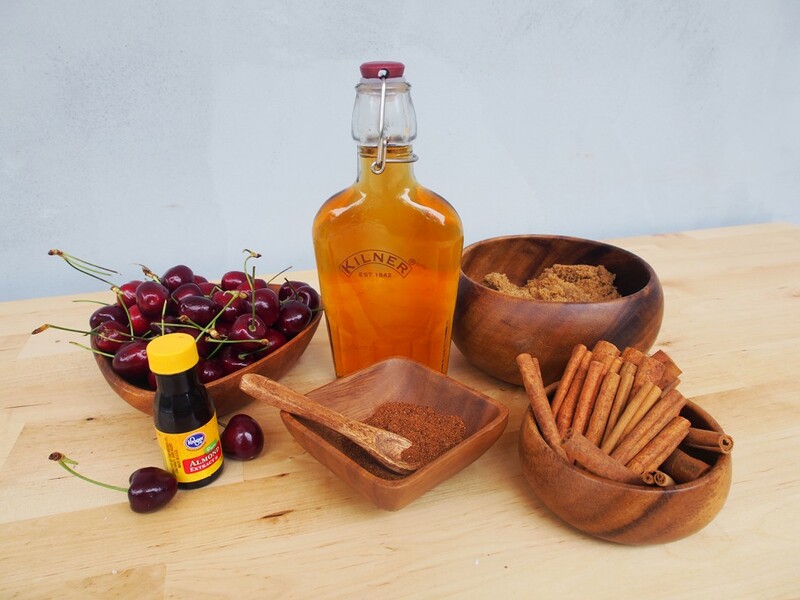 While it is very possible to buy high-quality cherries for cocktails (think luxardo cherries rather than maraschino cherries,) those high-end bottles of cherries in syrup are expen$ive!!! And with it being cherry season, and cherries being so cheap, I thought, why not make and can some of my own? They’ll be just as good (even better) than store bought, significantly cheaper, and way less scary. Bonus: they make awesome gifts or party favors. This recipe is really easy to multiply if you’ve got an abundance of cherries. 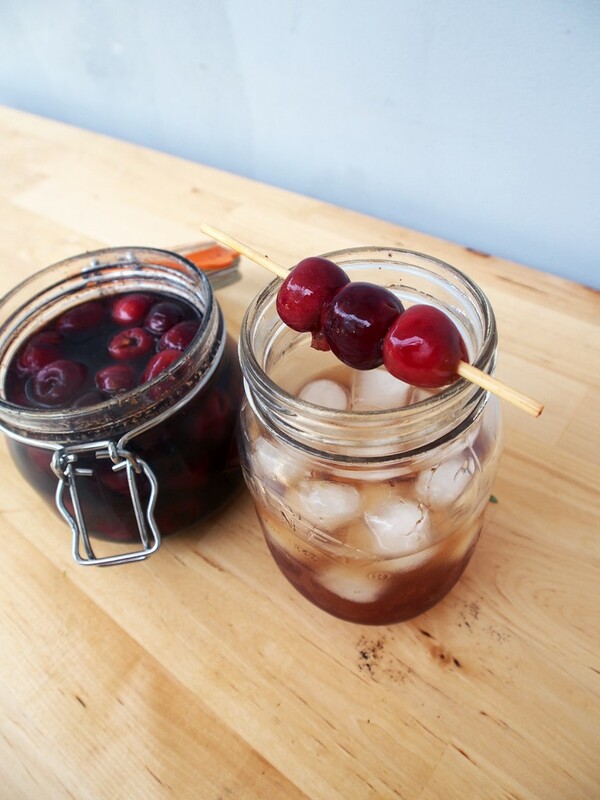 Ready for an awesome cocktail cherries recipe? Lets go. Add all ingredients except brandy and almond extract to a saucepan. Cook over medium heat, stirring occasionally until cherries release their juice. After about 5-7 minutes, turn the heat to low and add the maraschino liquor or brandy. Cook on very low heat for 20-30 minutes, stirring occasionally. When the syrup is very thick and sticky, remove the cinnamon stick and orange peel from the mixture and set aside. Remove from heat, add the almond extract. 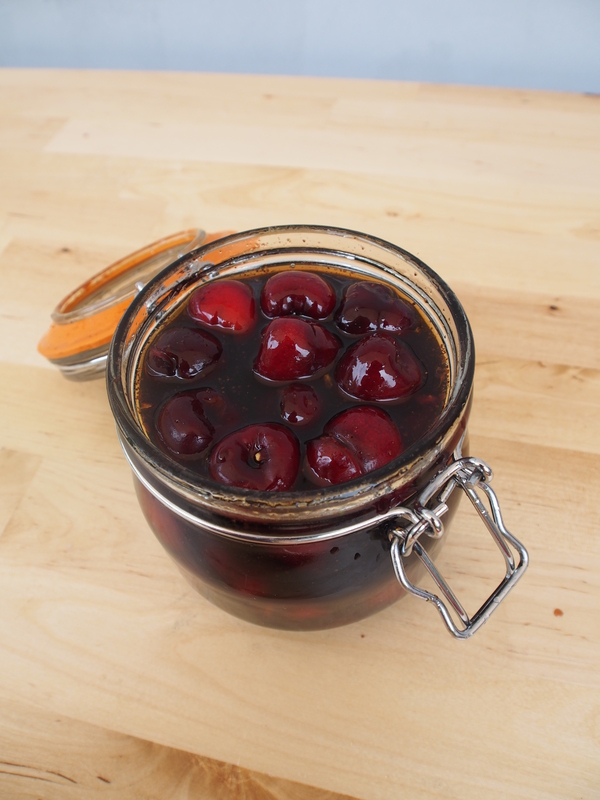 Immediately pour the cherry mixture to clean, sanitized jars. I like these kilner jars (or these! )for party favors or gifts, or these larger ones if I’m just keeping them on my bar cart. When properly processed and sanitized, these cocktail cherries will stay good for up to 6 months at room temperature, or a month opened in the refrigerator. They won’t last that long. 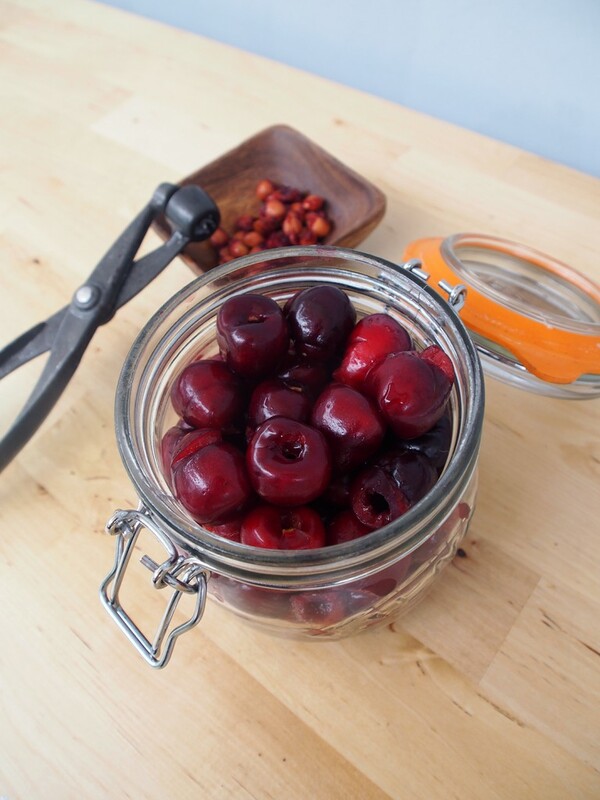 There you have it – a simple, delicious way to preserve delicious cherries during the peak of the season. If you really want to show these beauties off in a cocktail, keep it simple. A Manhattan or an Old-Fashioned will do the job. Other delicious ways to use up these cherries – drizzled over ice cream or yogurt, blended in to a milkshake, between layers of a black forest cake, or strain and bake into your favorite chocolate dessert. Just don’t throw out that syrup! It’s delicious! This entry was posted on Thursday, July 31st, 2014 at 5:15 pm and is filed under Canning, Cocktails, Do It Yourself, General, Gift Guide, Great Gift, Homemade, Recipes. You can follow any responses to this entry through the RSS 2.0 feed. Both comments and pings are currently closed.